HAYESVILLE, N.C. – Gloriann Gili, the former Gloriann Bernard, of Hayesville, NC, passed away Tuesday, June 10, 2014 at Clay County Care Center, four days before her 92nd birthday. Gloriann grew up in Montclair, NJ, the daughter of Roger and LaVange Bernard. She lived in Johnston with her former husband, Earle H. Smith, Jr. for over 20 years. She was predeceased by her loving husband, Rolando Gili, and her sister, Dorothea Orcutt. 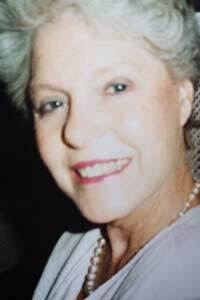 She leaves behind four adult children who grew up in Johnston; Earle H. Smith, III, Cathy Smith Weinberger, Roger Smith (Hallie), and Jacob Smith; two step children, Lynn Cavanaugh and Tina Gili; four grandchildren, and eight great grandchildren. Gloriann attended the University of Texas and returned to college to receive her Bachelor’s degree and Masters in Guidance and Counseling…both from the University of South Carolina. She went on to teach in South Carolina schools, was a guidance counselor in Louisiana, and a guidance counselor at Dekalb Junior College (now known as Georgia Perimeter College) in Dekalb County, Georgia from which she retired after many years. Gloriann loved to cook, garden, and entertain. She had many friends in all of the places that she lived and worked…in Johnston, Florida, Georgia, and her last home, Hayesville, NC, where she and her husband, Ron, built a home and resided after retirement. A private memorial service is being planned by her family at a later date. One Response to "Gloriann Bernard Gili"
I know Cathy and her brothers will miss their mother because we discussed this at length in the past. I am so glad that Cathy was able to come to our class reunion in Edgefield County in April and made the trip up to North Carolina to visit her mother one last time before she passed away. Our thoughts and prayers are with Cathy and her brothers at this time of their loss. All of us to grew up here in that timeframe remember this family well.